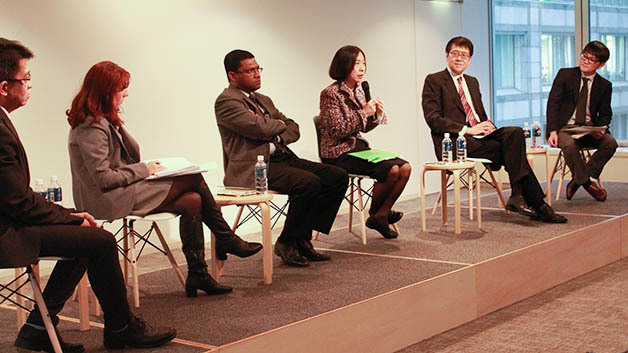 At a UNU-IAS public forum on 28 November 2014, experts from several UN agencies and other organizations discussed issues of mental wellbeing and disability in the context of disasters. The event shared key outcomes from a UN expert group meeting organized by UNU on 27–28 November 2014, including a set of recommendations for incorporating mental wellbeing and disability issues into the global post-2015 framework for disaster risk reduction. Ana Cristina Angulo-Thorlund (UN Office for Disaster Risk Reduction) noted a general lack of references to mental wellbeing within UN documents on disaster risk reduction, and explained that all opportunities should be seized to inclusively engage people in efforts to reduce their vulnerability. Florante E Trinidad (National Professional Officer, WHO Office of the Representative in the Philippines) stressed that there could be no health without mental health, which was mainly dependent on daily wellbeing. He explained that emphasis should therefore be placed on daily wellbeing to reinforce the resilience of communities. The public forum opened with remarks by Kazuhiko Takemoto (Director, UNU-IAS), stressing the impacts of mental health conditions on society, and the need to integrate consideration of mental wellbeing into national and international frameworks for disaster risk reduction. The forum was moderated by Atsuro Tsutsumi (Research Fellow, UNU-IIGH). An audio recording of the public forum including the discussion session is available below. UNU-IAS co-organized this event as part of the Fukushima Global Communication programme, a research initiative examining impacts of the Great East Japan Earthquake, tsunami and nuclear accident of March 11, 2011 on people and society, the challenges of the recovery process in Fukushima, and related issues of risk and information provision.